I have been using Laticrete products now off & on for nearly 20 years. But I cant say enough about the SpectraLock grout. Yeah cement grouts have came a long way with TEC’s Accucolor XT, Custom’s Prism and Laticrete’s Permacolor. But when you want to get right down to it and make sure you have a 100% stain proof grout, you need to go with SpectraLock. It’s by far is the best epoxy grout I have used. with the haze, it isn’t much of a factor with the SpectraLock. Contact Us if your looking for a Tile Estimate using SpectraLock Stain proof Epoxy Grout. Take a look at SpectraLock by Laticrete. LATICRETE® SpectraLOCK Grout installs easily, providing superior color uniformity, stain resistance and durability. Available in 40 colors. like a portland cement base grout. We also offer a wide selection of other grouts to fit your project and budget. 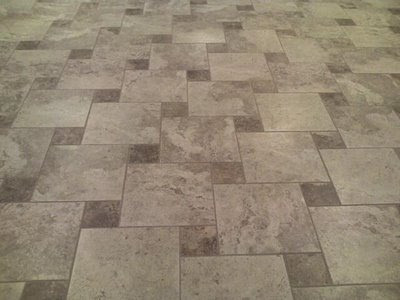 that is a great looking floor and with the spectralock grout it is stain proof ? I live near Tampa and Orlando and want my floor to look like that. Next post: Follow Ceramictec on Twitter……..